DIRTY DIAMONDS is an all-girl comic anthology. Each issue is open to submission and features (semi-)autobiographical comics around a central theme. 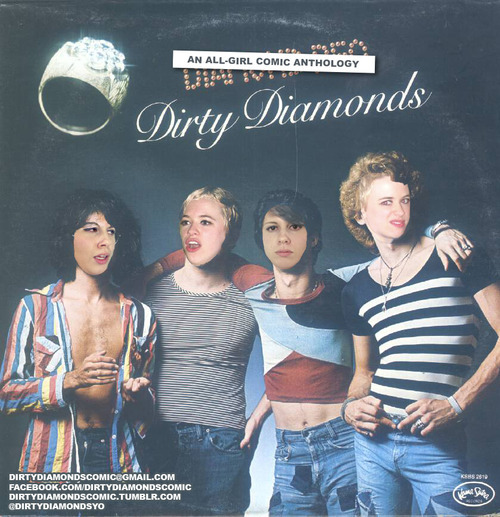 For more information and to keep tabs on upcoming open calls, follow Dirty Diamonds all over the internet! Dirty Diamonds is co-edited by Kelly Phillips and Claire Folkman, drawing buds since the 7th grade. Holding the fort on opposite ends of Philadelphia, they have been the loving parents of the all-girl comic anthology since 2010. Dirty Diamonds is now also proudly featured in the permanent comics collection at the Library of Congress! Kelly and Claire have each been featured in gallery shows, comic festivals, other anthologies, and even a podcast! Watch Kelly & Claire get interviewed at SPX 2013! Dirty Diamonds was founded with the help of two amazing ladies, Carey Pietsch and Dre Grigoropol.